Happy Fast Food Friday! I will be honest, the only reason I will go to McDonald’s is for the hash browns and the apple pies. 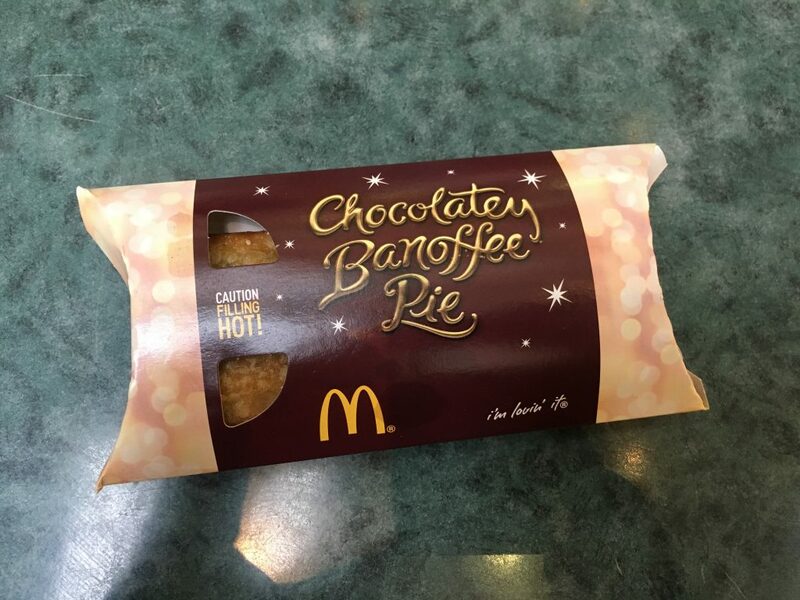 My little cupcake who has done a review on the whole festive shebang here, shared some valuable insight that this year they have forgone the fruit pie, and instead McDonald’s Chocolatey Banoffee Pie has come into our lives. Huzzah! This little boxed pie was £1.19, a small price to pay for what I hope is as enjoyable as their apple pies.I feel they could have been a little more festive in the packaging but nonetheless it was on the twinkly side. 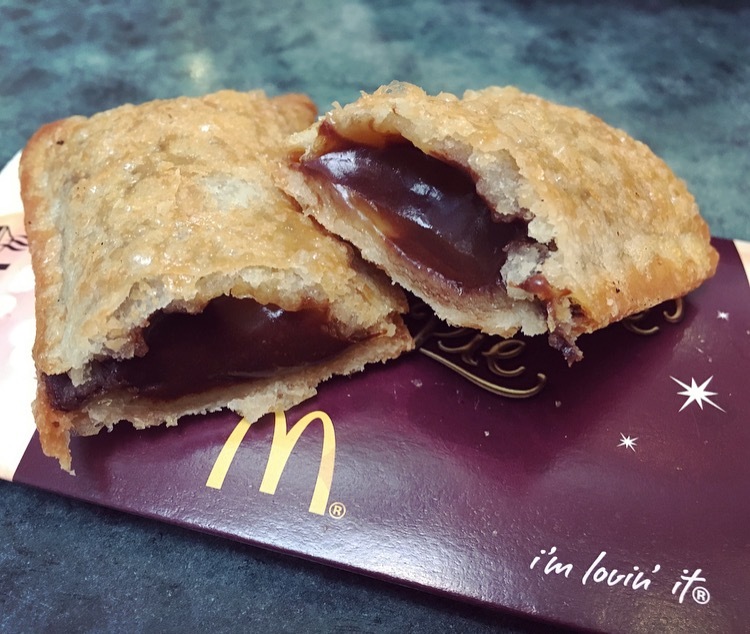 A hot crispy pie filled with a thick Banoffee sauce and a delicious chocolatey sauce. 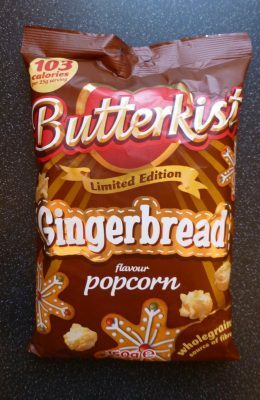 349kcal, 7.2g sat fat, 15g sugar, 3.1g protein. Look at that oozing filling, thankfully it wasn’t 8000 degrees and I could dig straight in. The pastry was buttery but not at all greasy and scored a 10 on the crispy factor. Despite the chocolate filling practically jumping out the flavours of both the chocolate and the banoffee sauce came through in harmony. The chocolate was silky, thick, milky and pretty good quality. The banoffee sauce had a strong authentic banana flavour that I just want a whole jar of. Chocolate and banana really does go hand in hand and this didn’t let it down. I really am in love with this McDonald’s Chocolatey Banoffee Pie. 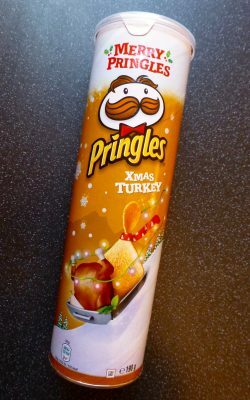 Despite not exactly reminding me of the festive period it was one scrummy pie. I hope that this makes a reappearance because it is a shame to only be here for such a short period of time. If there was ever a reason to go to McDonald’s this is it! Go Go Goooooo!